Hurricane Arthur hit North Carolina on July 3, 2014, and it didn't cause as much damage as many had feared. However, NASA has released some graphics that suggest why they were so concerned about this particular hurricane. 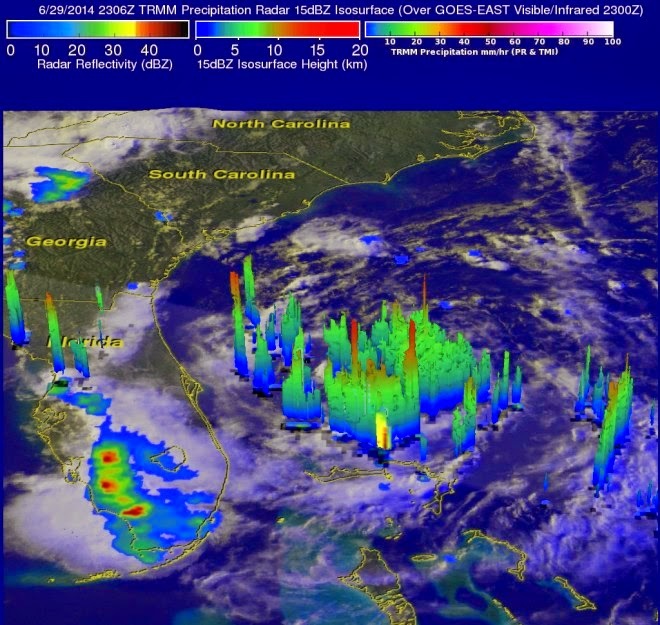 Middle scale at top indicates height of the 3-D clouds in Hurricane Arthur. Arthur is a category I storm that has high thunderclouds. To a meteorologist, taller clouds indicate a stronger storm with more wind. This is because they reflect the amount of energy being churned up by the storm. The animation derives from data transmitted by two sensors aboard NASA’s Tropical Rainfall Measuring Mission (TRRM) satellite, which provides the bulk of our data about incoming hurricanes. One of the sensors is the Precipitation Radar, which detects atmospheric vapor and uses that data build 3-D maps of clouds up to 12 miles tall. It is so sensitive to moisture, it can detect when rain is drizzling as lightly as .027 inches an hour, within a swath over 150 miles wide. Even more impressive, it does this from 250 miles above the earth’s surface, using less energy than four 60 Watt lightbulbs. While the Precipitation Radar provides a broad view of the storm’s structure, the TRRM’s Microwave Imager collects the volume of rain in the storm. It does this by measuring minute energy radiations. Atmospheric water vapor emits almost twice as much microwave energy as bodies of water, like oceans. On the imager, they’ll appear as abnormally warm blobs. Because rain emits about the same microwave as land does, the imager looks instead for ice particles scattered along the tops of rainclouds. When the animation was made, Hurricane Arthur was about 150 miles southeast of Cape Fear, NC, on a northeasterly bearing at about 9 miles per hour. Its sustained wind strength was about 70 mph, with gusts up to 90 mph. The clouds surrounding Hurricane Arthur’s eye reached about 6 miles tall. In the graphic, they’re the ones where the tips reach well into the red. However, there are some even taller clouds, called “hot towers,” in the hurricane’s outer bands. The massive amount of convective heat energy in these clouds causes them to scrape the top of the troposphere, about 9 miles up.